"Love is stronger than hate"
"The Republic against fanaticism." If you're wondering about the roller skates here, and the shoes in so many of these photos, it's because the Place de la Republique was also just the site of a protest linked with COP 21, the international environmental conference in Paris these past weeks. There was a huge march planned, but because it came just after the terrorist attacks, the government rescinded the permit for the march out of safety fears. So, symbolically, instead of gathering and marching, the Place de la Republique was filled with shoes, representing the people who would have marched. Some remain, and have been incorporated into the memorial for the attacks. Evidently, this person wasn't going to march but rather skate. I guess that's just how they roll. But not just patriotism for France. It's an outpouring of national pride and support from every part of the world, denouncing terrorism. "Killing people in the name of the Lord. In the name of the Lord, that's idiotic." But most are sympathetic or uplifting. The golden aura in the background is not a filter -- just the effect of late afternoon sunlight reflecting on the building behind. This one says "Paris chooses LIFE!" I like the afro-sporting woman in the lower right corner painted over the blue, white, and red Eiffel Tower base. Instead of the usual "Pray for Paris" tag we see everywhere, they've tagged it more accurately and literally: "Spray for Paris." There are just so many candles, flowers, and messages. Nearby, at the Bataclan theater, the worst spot of the massacre, there's yet another shrine (and at each spot where innocent people fell). Here's a copy of Hemingway's A Moveable Feast (in Spanish), which has been the most sold/purchased book here in France since the attacks. Why? It's a complicated question, but I love the very thoughtful answer given by the new editor of the Paris Review, Antonin Baudry. In brief, he suggests the reason is that this book is sort of a love letter to Paris, about Paris, by a foreigner, in the form of the arts, which has to be the way that France would most appreciate receiving such a message of love and support. It's psychologically complicated: Is that the reason people are buying the book? It sounds plausible. I think these lyrics for John Lennon's "Imagine" fit the bill, too. And if you were wondering if the Charlie Hebdo attack earlier this year has been forgotten, overshadowed by this latest, the answer is no. I think the French really see them as one big event, certainly inextricably linked both politically and in their hearts. Here at the Bataclan shrine, the symbol of the Hebdo attacks, the pencil, says "Je suis Charlie" on it. The flag at the top says, "Liberty, I write your name!" The sites are moving, touching, sad, angry, somber, silent, and also bursting with color, vitality, life, and hope. In other words, they're filled with both existential angst and joie de vivre -- very French, indeed. 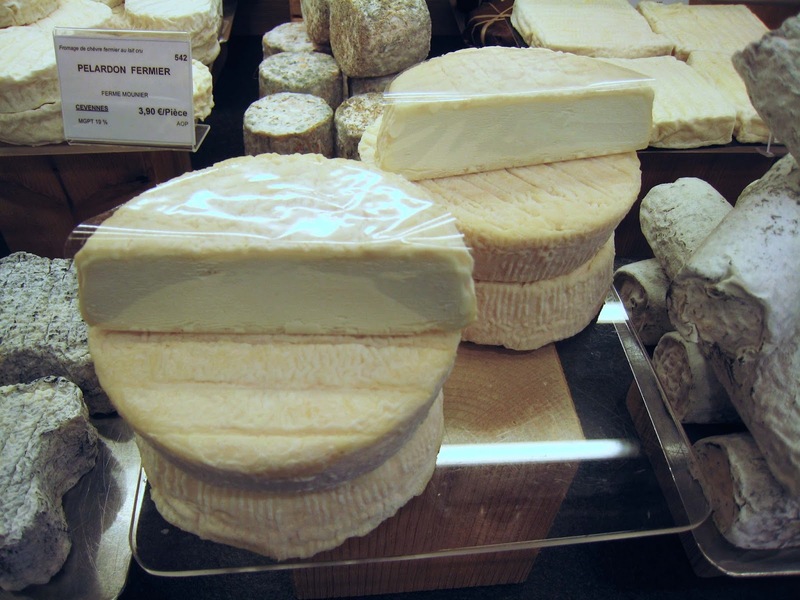 Grand Volcanique, or "The Big Volcanique", is a farmhouse cheese made from raw goats' milk in the Auvergne at the Reuss Farm. It's named for the volcanic region in which it is made, and I'm assuming the round shape is a nod to the volcanic calderas. Or else, they just felt like making it round. The grand is, as the name suggests, a bigger version of the Volcanique, but big or small, I'm betting you've never heard of it. It's a small-batch farmhouse cheese made exclusively in the Cantal region farm. Bigger means it usually retains more moisture in the middle, but honestly, there's no discernible difference other than the size (and price: the grand is about three times more expensive than the regular size). Fittingly, the cheese is an explosion of flavor -- complex, medium-strong, and tangy. It's a semi-aged cheese, meaning it's not a fresh new thing, but it's also not 24 months in a cellar. With just a few weeks of aging, however, Farmer Reuss is able to pack in a lot of flavor. Perhaps the goats should get the credit, now that I think about it. It's silky and luscious, with not just an acidic tang but also hints of peppers, flowers, and other vegetation. 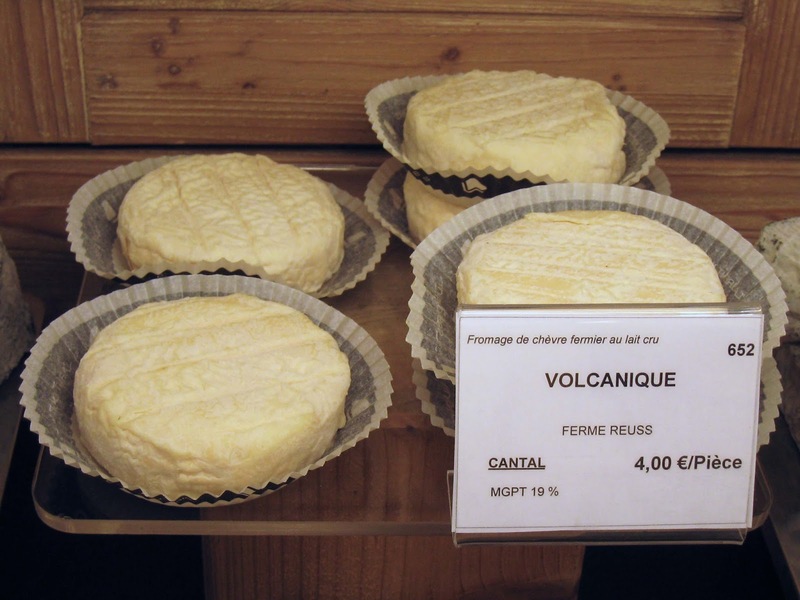 The name of the cheese, "Grand Volcanique", certainly suggests a large explosion, which is what this story is about on so many levels: a large explosion of violence, with large explosions that killed and injured innocent people, and a large explosion of a wide range of emotions: fear, hate, intolerance, tolerance, resilience, sympathy, hope, love.